TORONTO, Oct. 18, 2018 (GLOBE NEWSWIRE) -- Copper Lake Resources (TSX-V: CPL) is pleased to announce that prospecting, mapping and trenching has commenced on the optioned Mine Lake gold property located near the community of Savant Lake, Ontario, approximately 230 km northwest of Thunder Bay, Ontario. Selected Project Locations Over Simplified Geology. The Mine Lake property is adjacent to the past-producing St. Anthony Gold Mine which operated from 1934 to 1942 and produced 63,310 oz of gold from 332,720 tons, an average recovered grade of 0.191 oz/ton of gold per ton, which is equivalent to 6.13 g/t Au. The Savant-Sturgeon Greenstone Belt is similar to many of the Archean greenstone belts located in northwest Ontario, where orogenic lode gold deposits are closely associated with regional deformation zones. The property area has historically been explored for high-grade gold quartz veins and hosts numerous small pits and historical shafts that targeted the gold-bearing quartz vein systems. Visible gold in quartz is common. Most of these high-grade gold prospects on the Mine Lake property remain underexplored and poorly understood. The Mine Lake claims cover three prospects, namely Mine Lake, Thomas Lake and the Stewart-Contact Zone and covers approximately 480 hectares (4.8 sq km). Historically, the Mine Lake and the Stewart-Contact Zone saw extensive trenching, blasting of several pits, and the sinking of two shallow shafts with limited underground development. No modern drill holes have been completed and no assays have been reported from the 17 historical shallow drill holes. The potential for gold mineralization was recognized in the Mine Lake area during the 1930’s. The Mine Lake and Thomas Lake areas were prospected and 2 shafts were sunk on Mine Lake in 1934. Grab samples from an outcropping vein in the vicinity report visible gold being observed from a 3.0 m wide vein in the area, but no assays were reported. At the southerly Mine Lake prospect, a northwest trending shear zone or splay has been discovered. The zone is marked by intense iron-carbonate alteration and contains gold-bearing quartz and quartz-iron-carbonate vein zones measuring between 3.0 to 10.0 m in width. Sampling of the historic pits has returned assays of up to 29.0 g/t Au. Trenching and channel sampling in 2010 returned 6.90 g/t Au over 3.2 m including 20.1 g/t Au over 1.0 m. The northwest trending shear zones are interpreted to represent gold-bearing dilational structures extending from the main north-south deformation zone. These structures have not been drilled and are an excellent target for follow-up work. Exploration work performed in 2011 outlined at least two near parallel north-south striking shear zones marked by moderate to intense iron-carbonate and sericite alteration, increased sulphide content (pyrite/chalcopyrite), and gold-bearing quartz veins. The shear zones appear to remain open along strike. Work on the area during 1935 comprised three trenches along with sampling yielding quartz veins assaying from 0.52 to 1.93 oz/ton Au from No. 8 vein. A year later in 1936, channel samples from No. 10 vein produced an assay of 1.15 oz/ton. Previous exploration work at the Thomas Lake area has outlined at least two, near parallel north south striking shear zones exposed over a 1500 m strike length and up to 50.0 m in width. Moderate to intense iron-carbonate and sericite alteration mark the shear/deformation zones with increased sulphide content and gold-bearing quartz veins developed at the contacts between felsic volcanic rocks and gabbro intrusions. Grab sampling of exposed quartz vein zones in 1982 assayed up to 62.80 g/t Au. The vein zones are hosted by strongly sheared quartz porphyry rocks measuring up to 15.0 m in width. The vein zone remains open along strike. Trenching in October 2010 (1 trench) uncovered four composite quartz, iron-carbonate and sulphide vein zones that measure between 0.3 to 3.0 m in width. The vein zones are hosted by strongly sheared quartz porphyry rocks measuring up to 15.0 m in width and marked by significant sericite, chlorite and iron-carbonite alteration. The vein zone remains open along strike. A total of 114 channel samples were collected from the trench with significant assays of 15.4 g/t Au over 0.5 m. No drilling has been reported in the area. The westerly Stewart-Contact Zone is a parallel deformation zone located 500 m west of the Thomas Lake - Mine Lake gold trend. The Stewart contact zone was recognized as being prospective for economic mineralization by W.F. Stewart during the 1930’s. Grab samples assayed from 0.3 to 6.0 oz/ton on the Stewart vein, and from 0.4 to 2.8 oz/ton on the Contact vein. The Company recently announced (August 30 news release) that it would begin similar work on its nearby Queen Alexandra gold property. 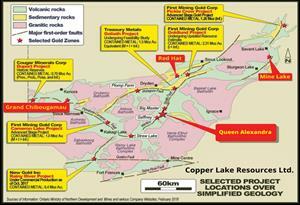 The Company has a mineral property option agreement to acquire up to 100% of four separate Ontario properties in the Kenora and Patricia mining belt: the Queen Alexandra Gold Property, the Mine Lake Gold Property, the Grand Chibougamau Gold Property and the Centrefire-Redhat Gold-Copper Property.